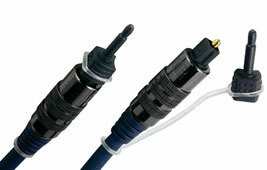 Both of these connections are for running the Digital soundtrack of the movie into a Digital amplifier or decoder for Digital Surround Sound. If only a short run is required from the DVD to the amp, we'd recommend using coaxial. If a longer cable is required (up to 10m) we'd suggest using optical as it is clearly better over very long distances. All sound information (including ordinary stereo and Pro-Logic sound) will be passed down these cables. See also: Coax versus optical digital debate. Almost every DVD player has a digital audio output. There is no noticeable difference in quality between the Phono and Optical output. For Dolby Digital, DTS, or MPEG-2, the appropriate decoder is required in the AV receiver or as a separate audio processor. For PCM through this output, a digital receiver or a DAC (Digital Audio Converter) is required.